For millennia, human beings have reported hearing ‘voices’. These experiences have been a source of fascination, sometimes because they spoke of revelation, sometimes because they presaged madness and destruction. From Socrates to the Yorkshire Ripper, the impact of voices upon human society has been considerable. But after all this time what can we really say about their causes, their meaning and their treatment? In the special issue of Cognitive Neuropsychiatry, Spence and David have edited a contemporary synthesis of what is known about voices (‘auditory verbal hallucinations’, AVH). Contributions are drawn from an internationally renowned panel of authors, most of whom contributed to a symposium held in Sheffield, England in September 2002 (‘Voices in the Brain: The Cognitive Neuropsychiatry of Auditory Verbal Hallucinations’). 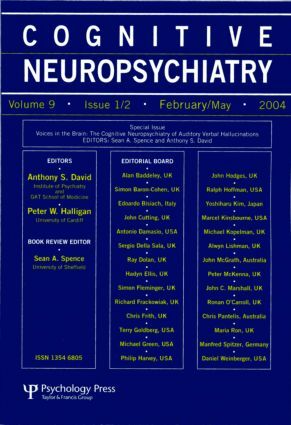 Topics included in this special issue are: a contemporary voice hearer’s perspective on voices and their treatment (Cockshutt); a phenomenological-hermeneutic interpretation of the content of ‘voice speech’ (Thomas, Bracken & Leudar); a review of the evidence for cognitive interventions used to treat AVH in a group setting (Wykes); a structured literature review of evidence for and against 3 cognitive models of AVH (Seal, Aleman & McGuire); a review of the functional neuroimaging literature on AVH and proposed directions for future discovery (Woodruff); the use of ‘virtual acoustics’ to model hallucinations in healthy subjects in the brain scanner (Hunter); a critique of contrasting cognitive models of the AVH phenomenon (David), an evolutionary account of schizophrenic voices and the place of language in human speciation (Crow); and the phenomology of a saint who was burned at the stake. S.A. Spence, Voices in the Brain. G. Cockshutt, Choices for Voices: A Voice Hearer's Perspective on Hearing Voices. T. Wykes, Psychological Treatment for Voices in Psychosis. M.L. Seal, A. Aleman, P.K McGuire, Compelling Imagery, Unanticipated Speech and Deceptive Memory: Neurocognitive Models of Auditory verbal Hallucinations in Schizophrenia. P.W.R. Woodruff, Auditory Hallucinations: Insights and Questions from Neuroimagining. M.D. Hunter, Locating Voices in Space: A Perceptual Model for Auditory Hallucinations. A.S. David, The Cognitive Neuropsychiatry of Auditory Verbal Hallucinations: An Overview. T.J. Crow, Auditory Hallucinations as Primary Disorders of Syntax: An Evolutionary Theory of the Origins of Language.